Mexican Americans in Chicago began to engage in politics through their unions. 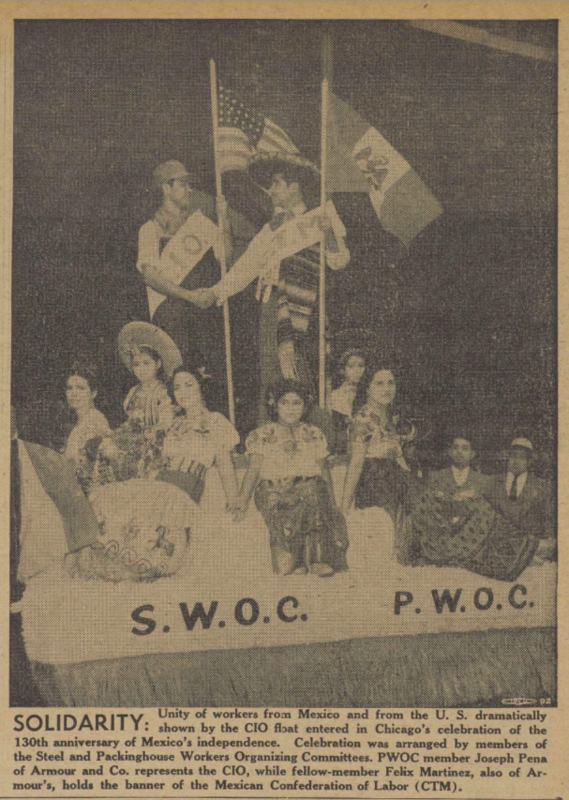 This CIO-sponsored float was part of the Mexican Independence Day parade in September 1940. The float promoted the Packinghouse Workers Organizing Committee (PWOC) and Steel Workers Organizing Committee (SWOC). These unions later changed there name to the United Packinghouse Workers of America (UAWA) and the United Steel Workers (USWA). The two labor groups represented large numbers of Spanish-speaking workers. This entry was posted in Midwest, Unions and tagged CIO, UPWA, USWA. Bookmark the permalink.